On the Saturday after the wet event in Christchurch I picked up the “cheap and cheerful” rental car from the off-site airport location. Two weeks, unlimited mileage cost me NZ$ 445 or around 2600 SEK which is a pretty fair deal compared with larger well known rental car company offerings. The car was a Japanese import with all the stickers still in Japanese, and 250000+ km on the odometer. It was an automatic and the blinkers and wiper stalks were reversed compared to a European car. After wiping the windscreen a couple of times I go the hang of where the blinkers were. to find that it was more expensive than renting the car! My second alternative was to buy a secondhand bike but one of my friends here, John W, said “no problems, borrow mine as I never use it”. Problem solved. I booked a room in Rangiora for a couple of nights on airbnb not really knowing what to expect. I then threw the bike and my bag in the boot of the car and shot off to Rangiora. Drving on the left is second nature as I learnt to drive in England and I never experience it as a problem. The room I found on airbnb was in a new detached house and even gave me the run of the rest of the house. Breakfast was provided and I sat in the living room in the evenings and chatted with the host Kevin and his lodger James. As it turned out, we were all radio amateurs so lots to talk about. When I left Christchurch I was running late but got started chatting to my friends’ neighbours and then when I rushed off I forgot my bike helmet. Use of a helmet is mandatory in New Zealand so I had to do the power trail on foot! Grr! It was upstream along the Ashley River and the round trip was some 15-16 km. 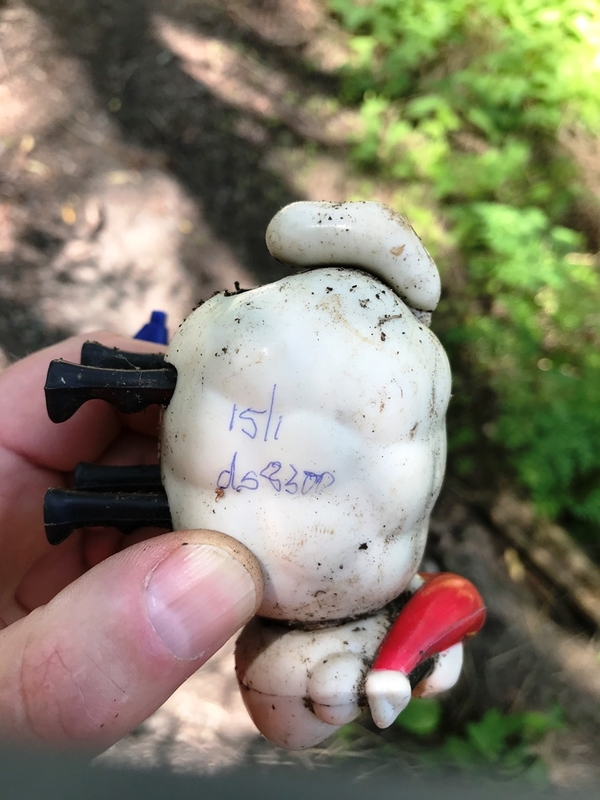 Most of the caches were in good condition but FFT – Do you have a weak stomach? was in need of maintenance. I had to sign the container! 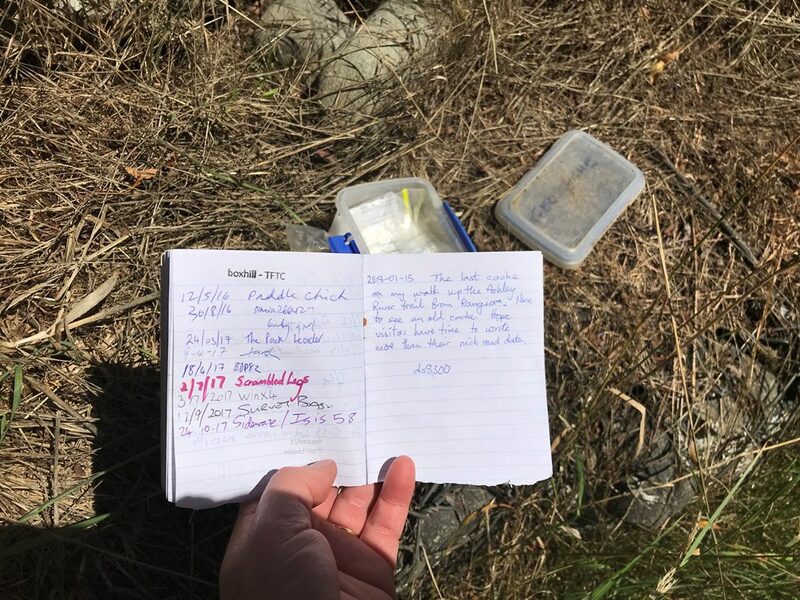 I finished off the trail when I got to Karen’s Rockery, an old traditional cache with a proper regular container and logbook. Karen’s Rockery, the last cache on the trail. 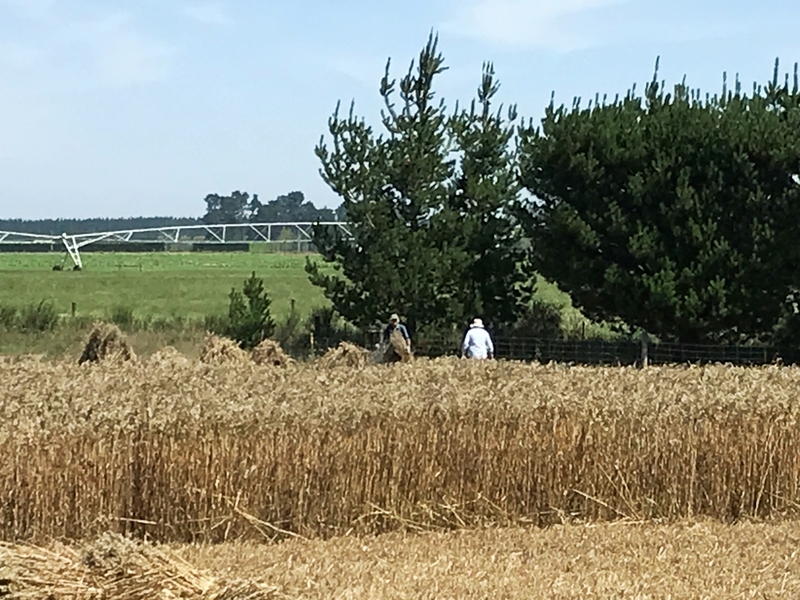 At one point on my walk back to Rangiora I saw some local farmers harvesting some grain, don’t ask me if it was barley or oats, but it wasn’t wheat at least, and they were forming the sheaves by hand! 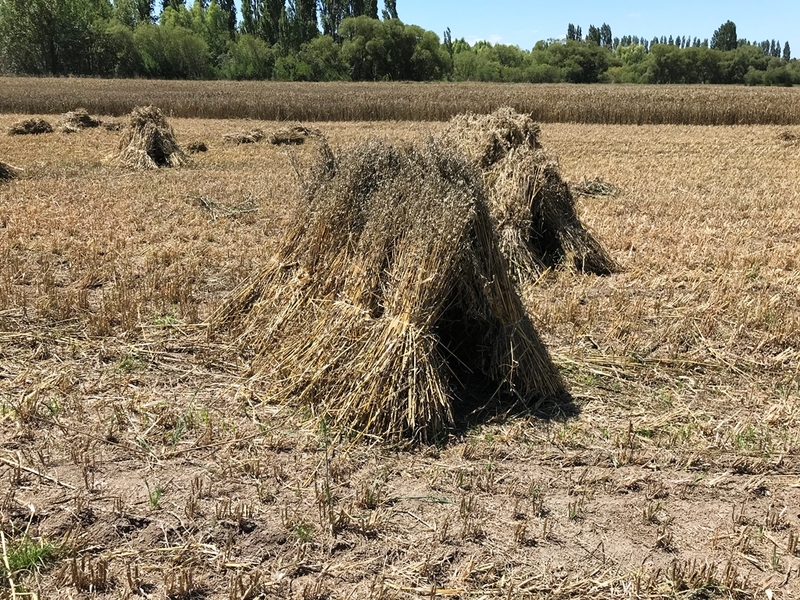 I stopped and talked with one of the farmers and he said that they were one of the few farms where they still did it this way. I didn’t ask why so that I didn’t upset him. It was a hot day so getting back to Rangiora and a cold beer at the local RSA club was really appreciated. devasted the township there are not so many new ones to hunt. In the afternoon I got back into geocaching and did another power trail of sorts but this time in the car. It was one called Lolly Scramble. I did part of it some years ago but for whatever reasons the pocket query didn’t completely download so I missed half of them. I expected my new PQ to fill in the gaps. Lolly Scramble – still not complete! There are some gaps where caches have been archived but even so there are a number of caches at the western end of the trail that my latest PQ didn’t pick up. Grr! I am not going back again. I finished off the drive westwards in the little town of Oxford where I did an Ingress Mission just to make a change from geocaching. I have found about half the caches in the township on previous visits.